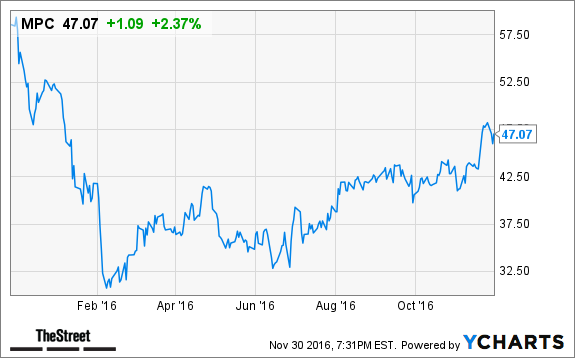 The CEOs of PVH and Marathon tell Jim Cramer they're seeing gains following the election. PVH (PVH - Get Report) : Cramer spoke with Manny Chirico, chairman and CEO of PVH (PVH - Get Report) , the parent company of Calvin Klein and Tommy Hilfiger that just posted a 20-cents-a-share earnings beat. 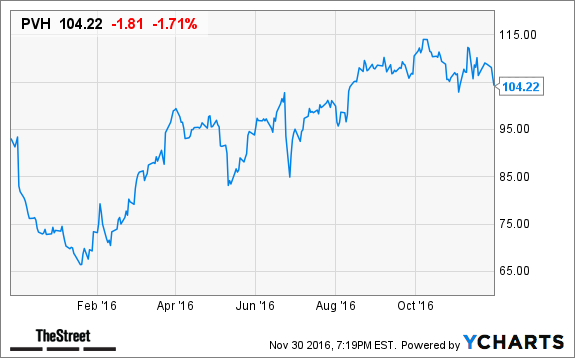 Shares of PVH are up 43% for the year, but the stock fell 1.8% Wednesday. Marathon Petroleum (MPC - Get Report) : Cramer spoke with Gary Heminger, chairman, president and CEO of Marathon Petroleum (MPC - Get Report) , the nation's third largest oil refiner. When asked about Wednesday's OPEC news, Heminger said that per-barrel oil prices in the $50 range is a good level to put people back to work and the deal to cut production is right where it needs to be -- which is why shares of Marathon Resources were up 20% Wednesday.